Once Again: How to Keep a Nonprofit Board Informed. With high performing nonprofit boards, directors will rarely be invited by the CEO to participate in operational decisions. As a result, management will always have more information than the board. Yet the board still needs to know that is happening in operations to be able to overview them. The name of the game is for the CEO to communicate the important information and to keep directors informed of significant developments. Still, there’s no need to clutter regular board meetings by reporting endless details about operations. •	Another technique is to use a consent agenda. With a consent agenda, routine and previously agreed upon items are organized together in the pre-meeting agenda and then, hopefully, approved as a group. If one or more board members question an item in the group, it is placed on the agenda for the next board meeting. This process eliminates the time consuming effort of having a separate discussion for each item. •	A third way is for the chief executive to meet with board members informally about every quarter. Occasionally, these meetings are with two directors at one time. At the sessions, the chief executive can discuss the more “entrepreneurial or wild ideas” that might need testing and update directors on operational decisions in greater detail. Some of the meetings can happen quite informally, before or after a committee meeting or after a monthly board meeting. Others can occur at appropriate social events. It is important to have the executive’s assistant keep track of the meetings and then to have authority to make new appointments to meet the quarterly schedule. Obviously, the CEO would need to meet with the board chair more often. If the board is a national one, meeting less frequently or a scheduled phone call are appropriate. One veteran CEO I know meets frequently with two board members. One is a long serving member, and the other is a newly appointed board member. 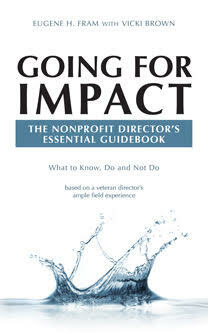 Keeping important information flowing to the board is critical to having a high performing nonprofit. It is a significant responsibility from the CEO. ← Can Nonprofit Boards Strategically Reinvent Themselves? The criticality and relevance of the the CEO appraising the Board on the operational goings need no much emphasis whether the reference is at the non-profit or profit focused institution! Certain contents,the strategic directions among others may tend to have differentials, however the cornerstone issues in management approach shall ever remain anchored on professionalism. The operational progresses,challenges and outcomes need to be communicated and updates to the board be in place in structured and regular basis per the peculiar needs of the set up. Feedback mechanisms with a view of addressing challenges or perhaps harnessing the emerged or emerging opportunities will be useful impetus for the institution for posterity. The distinctive role of the CEO and his/her management team must be set out with clarity vis a vis the board role of oversight. Otherwise potentiality of micro managing the CEO and his/her team can fell doom to an institution. Documented criteria as to how,what ,when to act on or respond to within the wider operational landscape is appropriate to minimize elements of confusion!